Looking for the best price on a storage container rental in Phoenix, Arizona? Whether your job is big or small, Haulaway Storage Container has your storage needs covered. 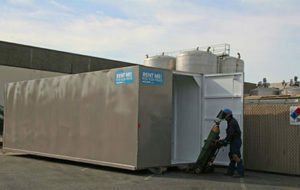 We have a huge inventory of affordable storage containers, and we deliver them directly to you. Our service goes beyond door to door – we offer white glove delivery, placing your storage containers exactly where you need them. All of the storage containers and shipping containers for rent that we offer are made only of the most durable heavy gauge steel, for maximum security. We offer a wide variety of sizes, in lengths ranging from 10 feet to 40 feet. All of our containers offer ample headroom and easy entry, making them convenient and safer to work in. Not sure what storage solutions will be best for you? Just contact us online or give us a call – we would be happy to guide you through our product line and help you find the best, most affordable options to meet your needs. Haulaway provides the best price on storage container rentals partly by having location throughout the West Coast including Phoenix. Having many locations allows us to be close to our customers, minimizing travel costs and allowing us to pass along the savings to you. At the same time, having multiple offices allows us to be more efficient and offer a larger inventory at lower cost. Affordable storage containers do not mean that you have to sacrifice on quality! Haulaway offers durable storage containers delivered directly to your property or job site and placed exactly where you want them, at competitive prices. Experience our great customer service and product quality for yourself. Don’t delay; call Haulaway Storage Containers today.